Roof design is a very important element for the overlook of our house. However, aesthetic is not the main thing when it comes about roofing. The roof material employed is key to avoid high maintenance costs in the future. Luckily, there are plenty of roof contractors and roofing companies in Derby (Derbyshire) able to design different roofs of great quality and appearance. Apart from teams of qualified builders, these companies count with shingles, roofing sheets, roof flashing materials, roof trusses and waterproofing materials to sale in case you are carrying the project on your own. Metal roofing: stop thinking of that tin roof for the shelter or a warehouse roof. Metal roofing looks cool for houses. Although it is more expensive, it is fire resistant and it can’t be eaten by any insect. 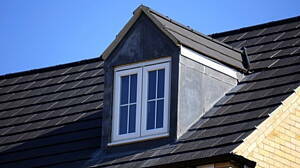 Slate roof: this real stone might be difficult to install so you must count on qualified professionals for this. Green roof: it provides great isolation and absorbs the rain. Tile roof: made of composite or asphalt roof shingles. They are the most common choice and they can perfectly last for 30 years. This, how much it will last, is one of the things to take into account when thinking of how to choose a roof for your home. The roof design can be very different from a flat roof to a very pitched roof, soft or corrugated roofing. Some of the top 15 roof types are gable roof, hip roof, mansard roof or flat roof. At Infoisinfo we always work hard to be able to offer you the most useful information so that you can easily find the best products and services for you and your company in Derby (Derbyshire). we want to help you to obtain the results you are expecting from your construction project, and one of the most important things is the roof construction. For this reason, we have prepared a list of the best roofing companies in Derby (Derbyshire) for you to choose from. Get I touch thanks to the contact details provided such as phone numbers, address, websites and opening times. In addition, you can have a look at comments and valuations from other clients to get a better idea about the construction services.